This revisitation of the painting "The Permafrost sonnet"
The upcoming group show at Dorothy Circus Gallery entitled Green Blood, curated by Alexandra Mazzanti and Tara McPherson, opens on June 14th and can be seen through July 20th. This exhibition will be an efflux of surrealistic paintings with a focus on the symbolism of life and nature. Green Blood features a wide variety of talented artists such as Tara McPherson, Jeff Soto, Martin Wittfooth, Travis Louie, Lola, Brandi Milne, Leila Ataya, Nicoletta Ceccoli, Roland Tamayo, Ana Bagayan, Scott Musgrove, Yosuke Ueno, Sergio Mora, Dave Cooper, Paolo Guido, AFan Alessandro Fantini, Alessia Iannetti, Anastasia Kurakina, Gary Baseman, Kathie Olivas, Brandt Peters, Chris Ryniak, Ixie Darkonn, Amanda Spayd, Mr. Klevra and Corine Perier. These artists are exploring mystical doctrines, creation, and how nature continues to be a centralized symbol of life. All artworks and drawings are created for charity and sales will be donated to Greenpeace and Oceana; charities that take care of animals and nature. "The green blood of nature differs from ours only for an atom, magnesium instead of iron. Twins of the trees and dependent upon each other. One ancestral link led to the development of the core mystical doctrines concerning the secret aspect of creation. The tree has always been used as a symbol of life. In the Kabbalah is the program according to which there was the creation of the world, and the path of descent along which the souls and creatures have reached their present form. It is also the path slope, through which the entire creation can return to the goal which we all long: the unity of the "womb of the Creator." "Tree of Life" is the "Jacob's Ladder" (see Genesis 28), whose base is resting on the ground and its top touches the sky. 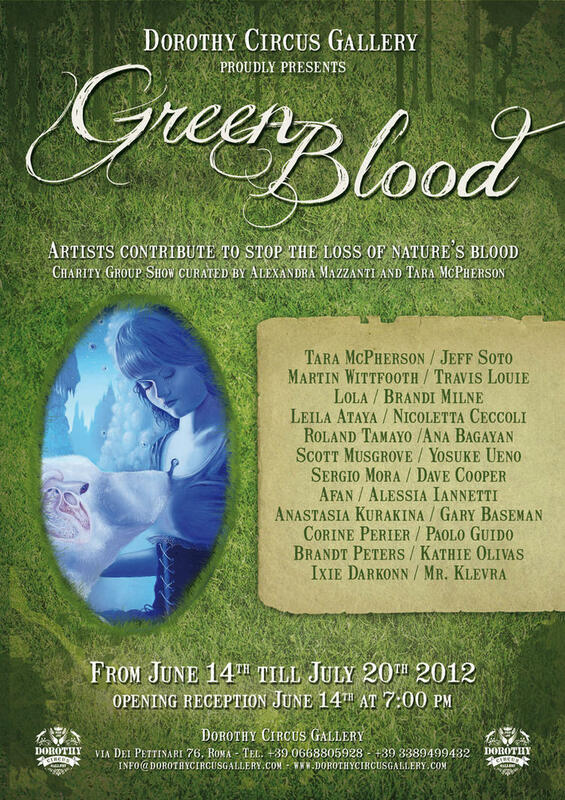 By trees, reminiscent of the ancient blood pact, by the green blood creatures, the artists of the Green Blood are inspired, involving the nature in its entirety and representing its entities through a surrealistic painting."